This post from last year defines my past few weeks. The heat has turned many of the gardens around town (especially my own) into jungles in need of structural support. Take a gander through this post for some ideas on how to give your garden some additional support. As the heat of the summer grows (or slowly ebbs and flows), I start to see the results of my undone to-do list. In the garden the things you leave for tomorrow often end up in wildness, anarchy and a particular kind of beauty. This year I am trying to be better about doing less of my job on the computer and more of it out in the gardens in our city. Our office (the Ecology Action Centre) has amazing little pockets of garden around our back deck and in the spirit of my new goal I have been giving it more attention than usual. The results have been pretty amazing both in the garden and in me, as I work on getting over my fears of building and general feelings of un-skilled-ness. This month I finally took some time to properly stake the tomatoes and got some help and to build a trellis along our front sidewalk. 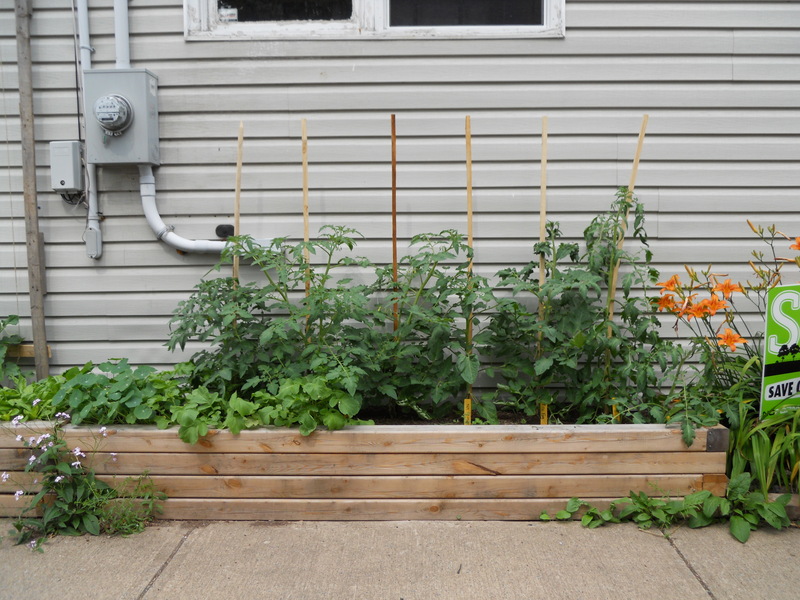 On the trellis we are growing beans, squash, and cucumber and I staked our tomatoes with 6 ft. hardwood stakes that I bought at Canadian Tire. Here is some information, photos and links about both of these things. I like staking tomatoes because it is easy and I think it looks nice. 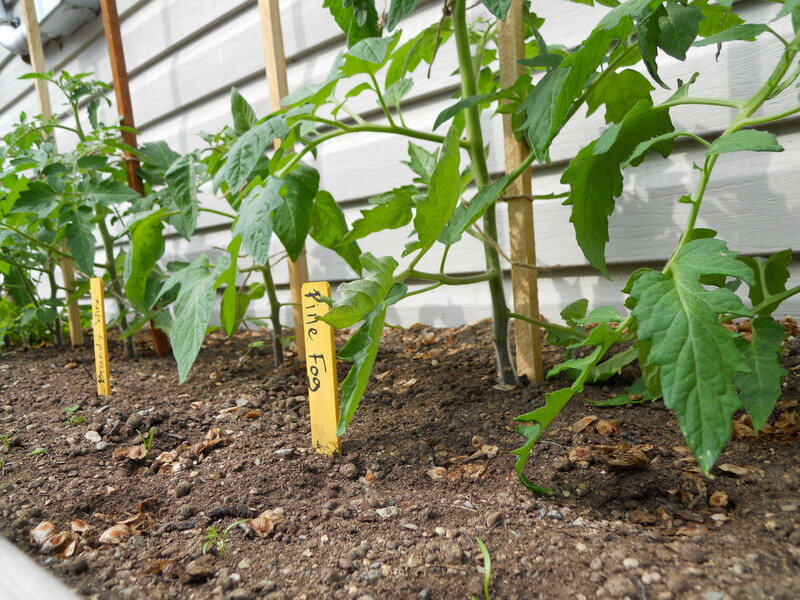 Before you start make sure the stakes are at least six feet tall to give the tomatoes enough to grow on. 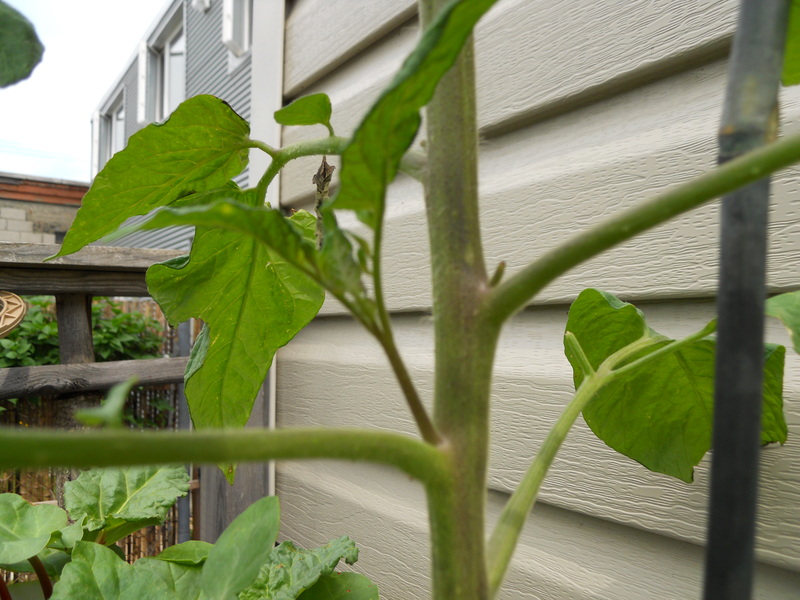 When I stake the tomatoes I like to pinch off the suckers, which are the shoots that crop up between the main stem of the plant and the branches. This helps keep the plant a manageable size and puts more energy into producing big yummy fruit. Then I tie the stem of the plant to the stake to secure it. I do this by first attaching twine to the stake nice and tight. Then I attach the twine very loosely to the plant stem, leaving lots and lots of room for it to grow throughout the season. 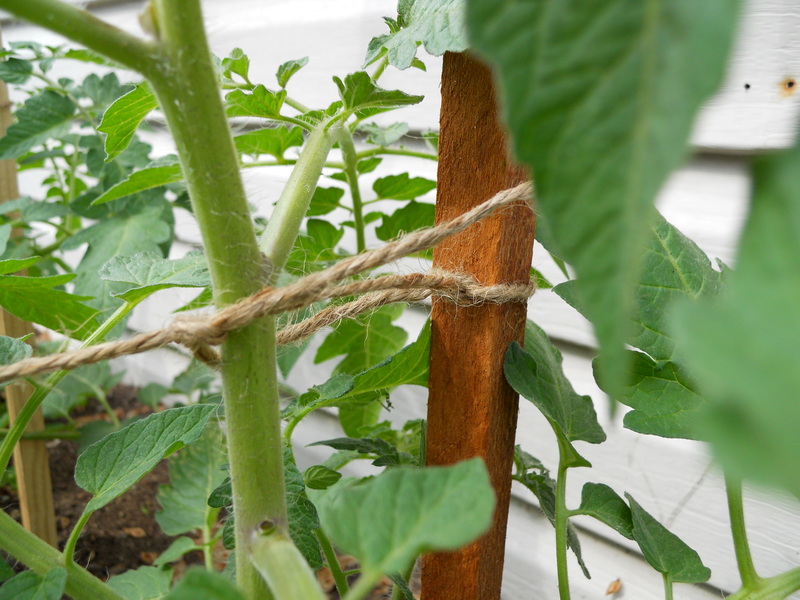 Leave a hopeful amount of room when you are tying the twine around the stem. 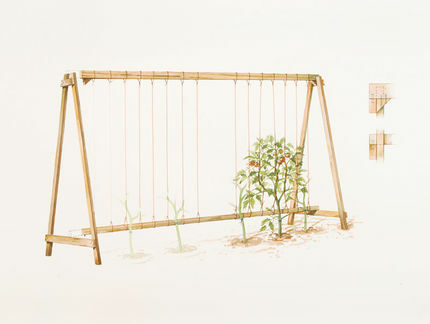 If you’d like something more substantial, you can build an A frame trellis and use string to train the plants up as another option. (See our links down at the bottom for A frame designs). 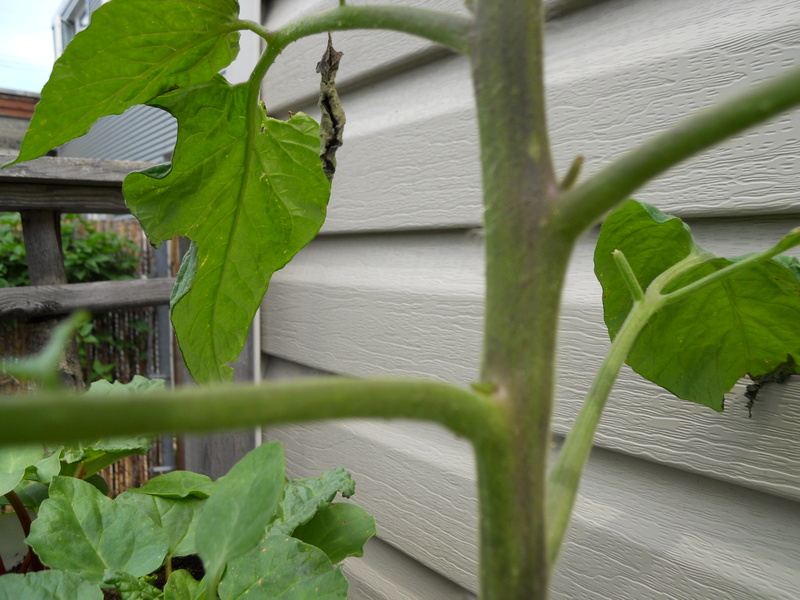 There are many ways to build a trellis for taller growing plants like beans. The main things to keep in mind as you build is that it is sturdy, secure and big enough for the plant you’d like to grow on it. 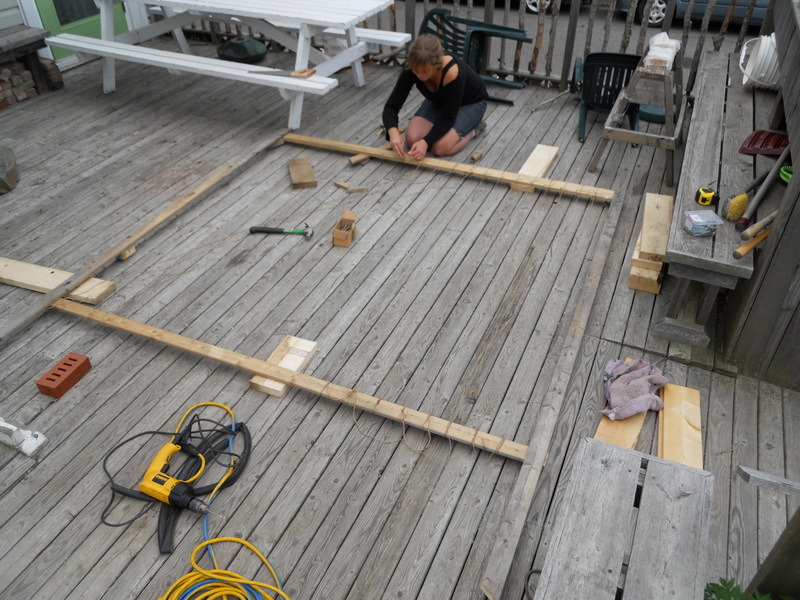 You will want to find a way to secure the structure in the garden depending on where you are placing it in your garden. If it is a bed in the middle of the garden you can bury the base of the trellis nice and deep, packing the soil around it tightly to that the structure is secure. A frame designs are great for this situation. If you are gardening in raised beds then you can attach the trellis structure to the side of the bed. 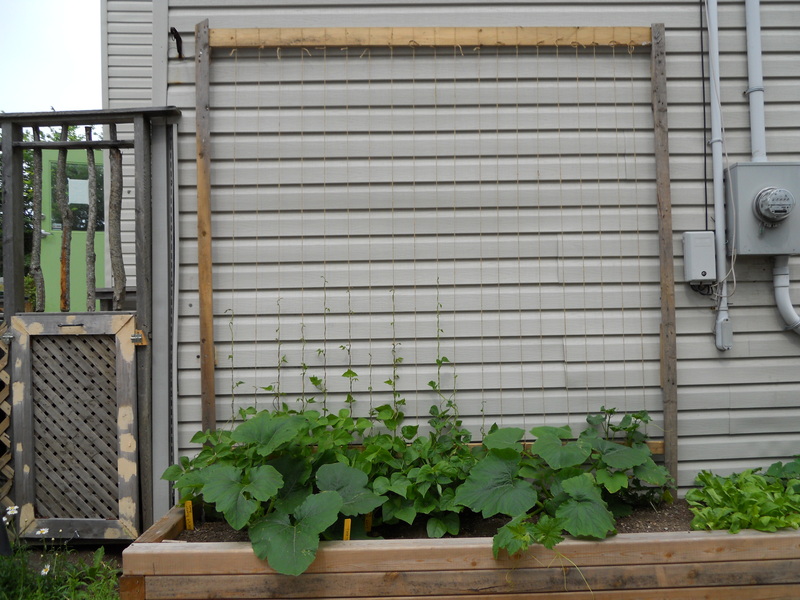 In our case we are growing the beans up a large wall, and so we built a very simple flat frame and attached the it to the vinyl siding, making sure to waterproof the holes with rubber washers and caulking. 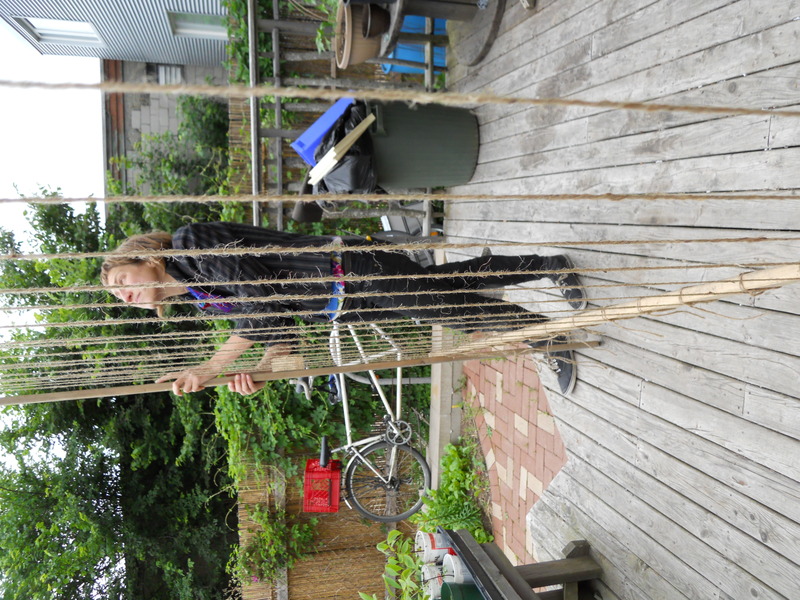 We then used jute twine to string vertically on the frame for the beans and cukes to grow up. 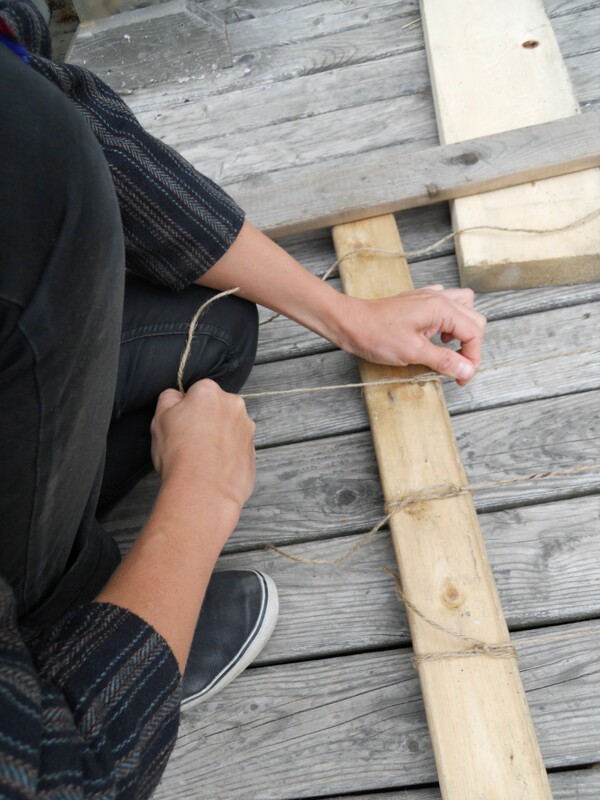 It didn’t take much time at all and since we had mostly scavenged lumber and supplies, we only had to buy the twine. Do you have any great trellis designs, tips or photos? 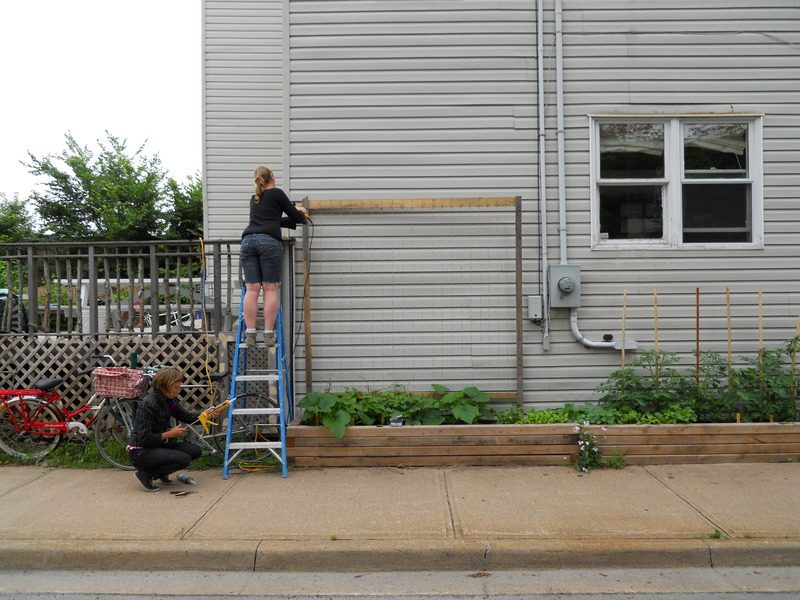 Send them to urbangarden@ecologyaction.ca We’d love to share them! 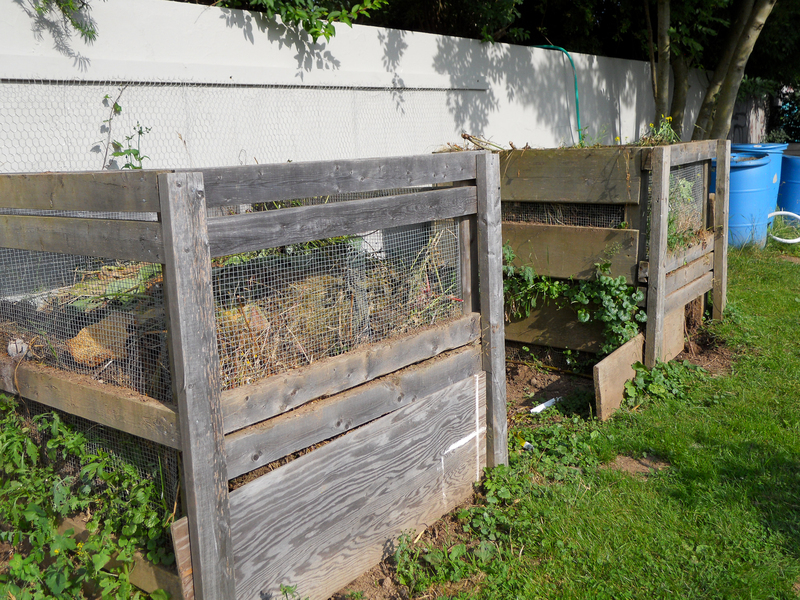 Backyard composting is an excellent way to provide nutrients for your garden while diverting waste from the landfill. Adding compost helps nutrients bind to soil, making nutrients more effective and reducing the amount that washes away with rainwater. Soil that contains a good amount of compost will hold water well, increasing its resistance to drought. The conditioning of soil that compost provides also helps build good soil structure to combat erosion as well as improve overall aeration of the soil. 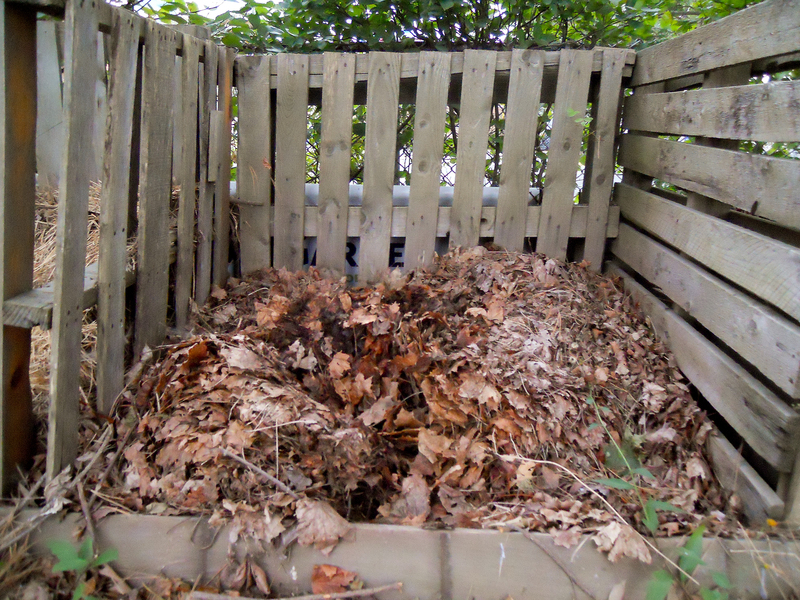 Composting takes minimal effort and only requires a slight change in some daily practices. It does most of the work on its own! 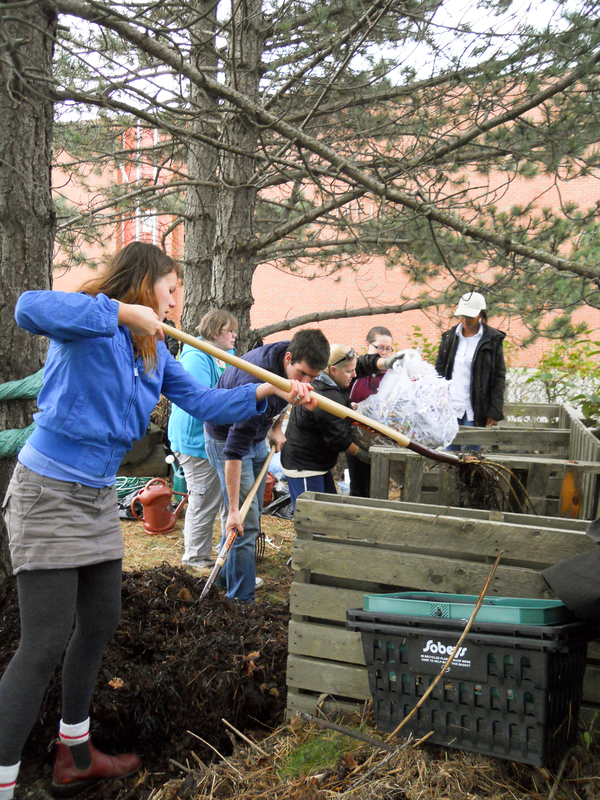 Composting can be done in commercial bins, home-made bins or even open piles. Unfortunately, backyard bins are not provided by the city, but can be purchased at Kent, Home Depot, Canadian Tire and Lee Valley. This website is a great resource to explore if you are interested in building your own composting container. If you want to be free-spirited and have an open pile, just be sure that it can be adequately covered to prevent it from getting too wet. Compost needs a good mix of green and brown materials. Green materials are moist and nitrogen-rich. These can be food wastes (fruit and vegetable scraps), bread, pasta, coffee grounds, tea bags, eggshells, weeds, grass clippings and so on. Brown materials are carbon-rich organic materials and tend to be denser. Brown materials can be leaves, straw, hay, woodchips, paper, cardboard, sawdust etc. You want to avoid putting diseased plants, seeding weeds, dairy, meat, fish, bones, fat, oil, pet manure and kitty litter in your compost pile. These materials take long to decompose, attract unwanted pests and could transfer disease. Great optional additions to compost are manure, seaweed, peat moss and bonemeal. These materials are valuable for their nutrient levels and abilities to correct pH. For more information about pH, soil testing and amendments check out this post from earlier this year. Decide on what kind of container or pile you want. 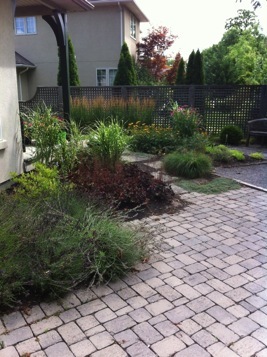 Find a nice, shady or partially shady area for it. 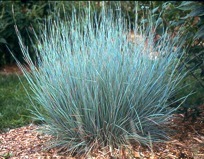 Place a layer of brown material at the bottom of the bin or pile, water it, then pile a layer of green material on top. Alternate between brown and green layers, watering each layer as you go. Be sure that your top layer always consists of brown material. This keeps critters and pests out, while keeping the important decomposers in! It might be a good idea to have a bag of brown material next to your compost pile for when you add your green material! You want to keep your compost moist, but not too wet. Be sure to water it occasionally and cover it before heavy rains. You can turn your compost if you want it to decompose faster. For a slower process, poke holes in the centre of the pile with a pitchfork or other garden tool. Finished compost has an earthy smell and dark, spongy texture. You can expect it to take between 3 and 6 months to break down. Now you can use your rich beautiful compost liberally through your garden.Your plants will thank you for it! A good boost from compost-rich soil will effectively strengthen the health of your plants as well as their ability to resist insects and disease. We want to to know your composting tips and tricks! What’s your favourite compost ingredient? How often do you turn it (if at all)? Let us know, down below! 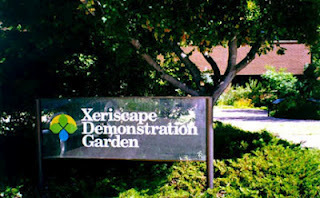 Looking to build your backyard soil? Curious about compost tea? Check out this DIY compost tea brewing project. Want to learn about leafmould?